Many students at Surrey's Queen Elizabeth Secondary School face daily and complex challenges -- lack of food, no transportation, no consistent home base, inability to cover extra costs like school supplies, and limited access to extra-curricular activities or school social events. Providing these basic essentials not only allows these at-risk youth to thrive in the classroom, but helps them to feel safe and cared for. 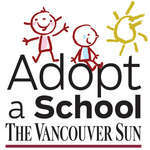 The school's emergency fund, which is seeking a grant of $5,500 from The Vancouver Sun Children's Fund Adopt--a-School program, helps provide basic essentials such as grocery store gift cards, clothes and transit passes to 35 inner city children with high needs.